This New Moon cycle carries great potential for change and will provide the fuel that we need to finalize and prepare our goals. There are plenty of planetary shifts ahead that hold potential for long term change. During this cycle, Uranus moves into Taurus, and Mercury goes retrograde just days before the New Moon, while the Sun moves into Aries on the 20th, the day of the Full Supermoon! Big shifts are happening in the sky… which means we too, will be experiencing opportunity for our own change. As above, so below. 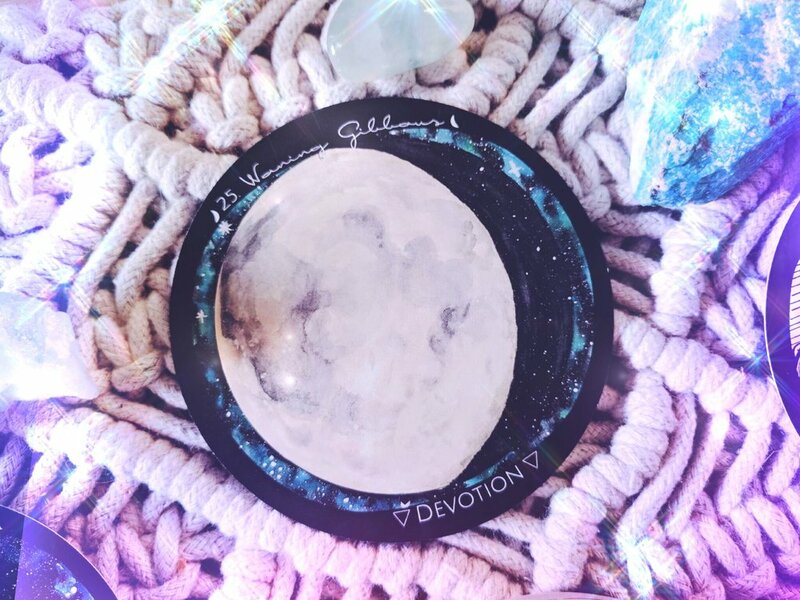 Each month using the Moon as our guide, we look to the Stars with our Spirit de la Lune decks & planners to create the New Moon Energy Reading to better prepare for what is ahead. ...so grab a cup of coffee, your planner & deck and scroll down to see what this New Moon Cycle has in store for you! This New Moon in Pisces takes place on the 6th of March. Pisces tends to increase our intuition and emotions as well as heighten our empathic abilities! Emotions tend to predominate over logic and common sense, but it’s a great time to use your imagination to visualise and create your future! Uranus moves into Taurus on the 6th of this month. Because Uranus is a slow moving planet, it’s lessons are big and hold lasting is effects. Uranus will be in Taurus until 2026. New insights and big shifts are on their way to you with this planetary change. Uranus moving into Taurus might bring us new lessons that highlight our sense of security and home. Uranus is a planet of change, while Taurus loves security and feelings of safety. Remember to be adaptable and as fluid as possible since these are somewhat opposing energies. Taurus IS about growth, but it relishes in organic and authentic growth, so go with the flow if you want to see change. Mercury is retrograde from March 5th to the 28th of march in the sign of Pisces. This can cause communication issues. Now is a good time to backup your computers and hard drives and have some understanding for yourself and others. Miscommunications can happen easily so practice patience! Now is not a good time to sign any big contracts or make any big life changing decisions or purchases. It IS a good time to set intentions, journal, and visualize the future you want. Mercury retrograde in Pisces highlights your intuition and third eye. It’s a great time to meditate and visualize what you want your future to look like. Sometimes Mercury retrograde slows us down so we can see then make the needed inner changes first. The card pulled for this phase is Waxing Crescent: Create. With Mercury retrograde, it might feel like your goals and creations aren’t getting off the ground as fast as you would like! Instead of getting frustrated and trying to force things, go within. Mercury is retrograde in Pisces which opens your third eye and focuses on your intuition and imagination. Use this to your advantage by visualizing the future you are wanting to create for yourself. Hold yourself in that space for as long as you are able, to build momentum towards your goals. Your powers of creation begin in your imagination. The moon reaches the First Quarter turning on the 14th of March in the sign of Gemini. Gemini is a social and cheerful sign that favors both intellectual and social pursuits. It’s a great time to make your weekly to-do list and get started on whatever sparks your interest! Remember, Gemini can also awaken our spontaneity, the scattering or variety of interests/projects could make it hard to get tangible results right now. It will be important to focus this week if you want to get things done and see any physical results. The card pulled for this week is Waxing Gibbous: Strength. The Waxing Moon phase this week is all about momentum and movement forward. The element is Fire and it truly can be felt during this Waxing Phase! As the seasons get ready to change, your inner fires will be stoked and you will feel your strength return in many ways. Don’t worry if you have had several projects waiting for your full attention. Try to just focus on what is in front of you for now and trust that you will have the strength to carry out your goals. Use this new wave of energy to lift you up to reach your highest potential. This Full Planting Moon is a big one! This is the last of the 3 Supermoons and also takes place on the day of the Equinox! The Northern Hemisphere enters the Spring season, while the Southern Hemisphere begins the season of Autumn. Night and day share equal time right now and the Moon is in Libra, the sign of balance and harmony. When the seasons change, we too are presented with the opportunity for transformation. The Wheel of The Year turns again with Aries the first sign of the zodiac, helping us plant the seeds for the months ahead. Aries, the Inspirer, ignites our inner fires and gets us excited about our future. The seeds are planted and we are gaining the energy we need to tend the garden. With Mercury still retrograde, it might be hard to get anything really going, but you can use this time to find your inspiration and fuel your passions. The balance of the night and day can give us the perfect amount of logical introspection we need to make and finalize our goals. The card pulled for this is week is Waning Gibbous: Devotion. What are you currently devoted to? Where do you direct most of your time and energy? Remember, where focus goes, energy flows. Keep your eyes on your goals and don’t be dismayed if it feels like things aren’t going your way… Remember that all things ebb and flow! Even during the darkest times it’s important to remain devoted to our personal principles and intentions if we truly want to see movement. The Sun moving into Aries at this time inspires our passion and conviction, so trust in the inevitable progress ahead of you. As the seasons change this week, you too will find the opportunity and potential to transform. The Last Quarter Moon takes place in Capricorn on the 27th of March. Capricorn brings out our more disciplined and orderly side. Capricorn, an earth sign loves order and structure. The Last Quarter Moon phase is also the element of Earth increasing our need for security. The Moon is waning in the sky once again preparing for the next New Moon. Now is the time you may feel called to do the same. With the Last Quarter Moon in Capricorn, this week a great time for tying up loose ends and finalizing plans and goals. Mercury goes direct on the 28th of March and we can finally take the steps towards the goals we have been visualizing towards all month. The card pulled for this phase is Waning Gibbous: Listen. The Moon’s energy begins to spiral back down to Earth. This gradual descent inward does not mean her power is lessening. Inward energies are beginning to activate. It is time to listen to your inner wisdom. Intuition ebbs and flows, and while the moon is waning, our intuition grows. The more you listen, the clearer the messages will get. If you are having a hard time connecting to your intuition, try using divination tools. Oracle cards, pendulums, runes and crystals are great ways to activate your intuition. Using them often can help strengthen your abilities just like any muscle. Take time this week to truly listen to the voice within. Did you like this reading? We are now offering private readings! Learn more and book a reading! The Planner is now on sale! (originally $48) no coupon required! Happy New Moon in Pisces! March looks like it’s going to be a month full of opportunity. 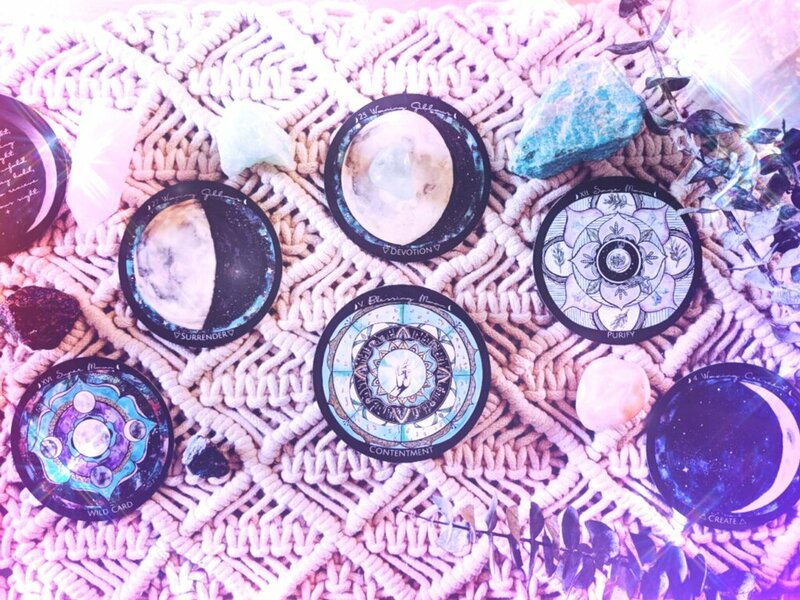 Don’t forget to charge your decks and crystals under the New Moon and check back here for the Full Moon ritual! Happy New Moon in Gemini! This New Moon is bringing in the start of a new cycle! Before anything new can begin, we must first learn what it is that needs to be cleared. This helps give us an idea of what we DO want to bring into our lives. This New Moon invites you sit back and listen. Take time in your reactions and responses. The Moon rules our deepest emotions and feelings. Her last visit through Scorpio may have caused some old wounds to surface. The Gemini Energy is pushing you to become the observer in your life. Take a step back and be aware of your thoughts as they help you navigate your emotions. This New Moon has a new beginning in store for you, but you must first sit back, watch, listen and observe yourself to what it is you are needing to let go of, in order to begin anew. Each month we put together an energy report on the coming lunar cycle. We also draw a card from the Spirit de la Lune deck for each turning to help us navigate the lunar energy. Grab your iced coffee and read below for this cycle's full energy reading! This New Moon in Gemini occurs on May 25th. This cycle ushers in the energy of the Honey Moon, as she turns full later this month. This New Moon in Gemini carries very potent energy for you to be able to heal and clear past wounds and turn over a new leaf for a fresh beginning. This last Full Moon in Scorpio may have brought some old wounds to the surface in order to be looked at, cleansed and healed during this New Moon in Gemini. The Super Moon Card was pulled for this turning, which matches the intense energy this cycle may hold. 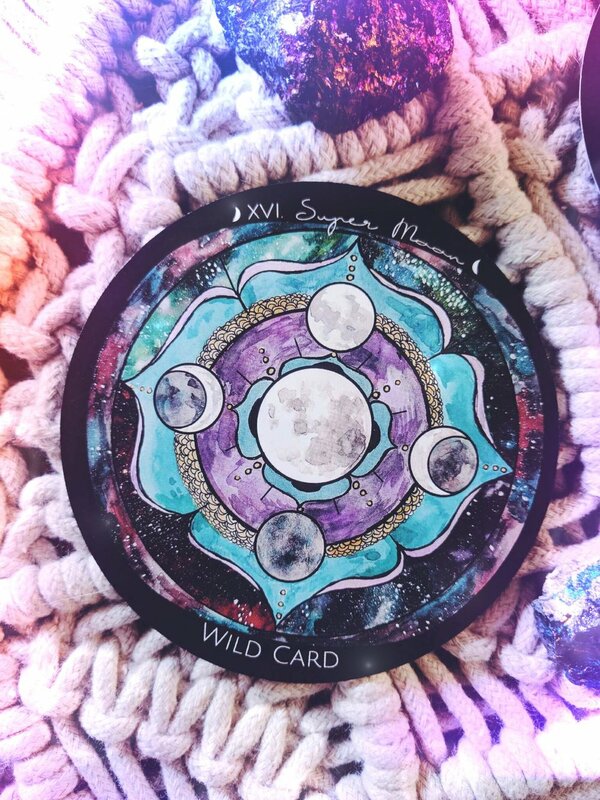 There are some astrologers stating that this is Super New Moon, so it's no surprise that the Super Moon card came out during this reading! This intense energy shows that anything is possible right now. You may not be able to predict how things will turn out, but you can focus your thoughts on what you want. Use this Gemini energy to sit back and listen intently to your inner voice. Watch your mind chatter, and see what kinds of things you tell yourself day to day. Are you thoughts directed towards where you want to go? The moon turns to First Quarter on the 1st of June in the house of Virgo, the Healer. The Virgo in you loves to pay attention to the details and fix what might be broken... if you've listened to yourself during the Gemini turning, you may have a good idea as to what it is that needs the healing. When the moon is in Virgo, your body may be more intolerant of lower grade foods, harmful substances, drugs or alcohol. Your body wants to begin a healing process. So be careful what you put into your body at this time. The Lover Card was pulled for this cycle, a perfect combo with the Virgo card. Both are Earth energies reminding you to be grounded as the Moon turns into the fire energy of the waxing moon. Virgo energy can tend to be perfectionist, fault-finding, and sometimes overly-critical. remember to apply some love this week. Especially if you are finding any faults within yourself. The Full Honey Moon in Sagittarius occurs on June 9th. You might be feeling a breath of fresh air around this moon. Sagittarius is an optimistic and open sign. You may find some answers to your questions around this time just because you've shifted your mood from stress and overwhelm to optimism and clarity. This is also the Honey Moon! Productivity will be at it's highest, so now is the time to get things done. The energy is buzzing like bees, so again it's important to not become overly stressed. Reach out to your community and others in your hive who could offer you some help. The Connect Card was pulled for this cycle, an echoing of the community message from the Honey Moon card. If you are still feeling overwhelmed, reach out to your tribe. Ask for help. The energy is loving, adaptable and centered around community and building. The moon turns to Last Quarter on June 17, in the sign of Aries and Pisces depending on your time zone. The Last Quarter Moon signifies the coming New Moon, and has us beginning to turn inward as well. Being in the house of Aries, you will likely feel pushed to get everything done. Don't procrastinate or put off your goals! Use this last push of energy before the moon shifts into New. Card pulled for this phase is Refine. Take time to double check or refine your work this week. You may not be able to take the big steps Aries is pushing you to take right now.. but there is always refinement o be done. Take small steps and double check your work. This energy supports problem solving, brainstorming and finding out of the box solutions. Don't forget to check back to the blog this Full Moon for our Honey Moon Ceremony! We hope you enjoyed this month's energy reading! 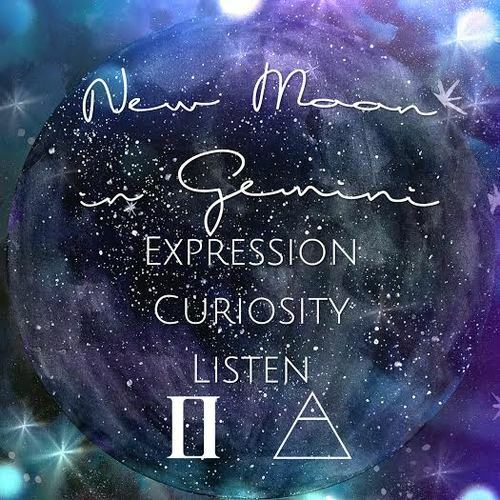 Don't forget to charge your crystals and deck under tonight's New Moon, place your intention and listen in on what this Gemini New Moon has to teach you! Sign up below to become a part of our ever growing tribe! 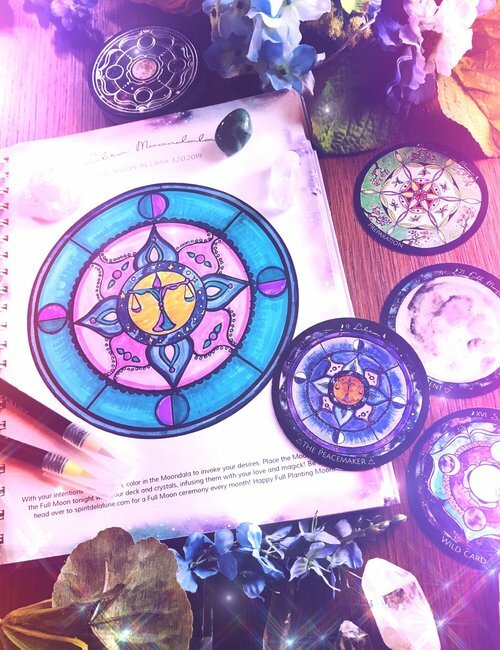 You will receive monthly lunar updates, full moon ceremonies, news about the deck, and future updates!